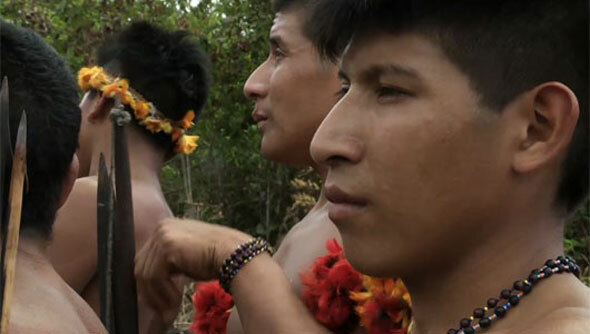 Survival International supporters around the world held an international protest on UN Human Rights Day, urging Brazil to ‘Save the Awá’; Earth’s most threatened tribe. A supporter in carnival costume led the demonstration outside London’s Brazilian embassy, carrying a clear message for that country’s government. 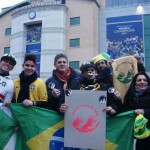 She was joined by a group of supporters who wore matching T-shirts, held placards, and distributed stickers, repeating the demand, ‘Brazil: Save the Awá’. The protest kick-starts Survival’s stencil campaign, which urges people to ‘get creative’, in order to generate a visible groundswell of support for the Awá. Survival, which coordinated simultaneous action in five other European cities, as well as the Californian city of San Francisco, then handed in a letter to Brazil’s embassy. 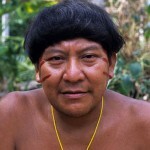 The letter called on Brazil to honour its promise to implement ‘urgent measures’ to remove illegal invaders from the Awá tribe’s demarcated territories. Identical letters were handed into Brazilian embassies and consulates in Madrid, Paris, Milan, Berlin, The Hague, and San Francisco. 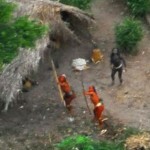 In Spain, a big box containing the letter was given to embassy staff, to symbolize the volume of messages (nearly 50,000) that have been written to Brazil’s Justice Minister since Survival and Oscar-winning actor Colin Firth launched a campaign to save the tribe in April. Activists in the Netherlands also placed stencils of ‘Save the Awá’ around the capital’s iconic Dam square, whilst in France dozens held placards in solidarity.